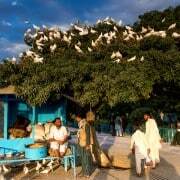 Each autumn we run a trip to Afghanistan and we think it is the perfect time to visit. We start in Kabul before taking a short flight across the Hindu Kush to Herat, the most architecturally complete city in Afghanistan. Then we will move on to Bamian where we spend three days exploring the valleys, the Buddha niches and the lakes of Band e Amir. 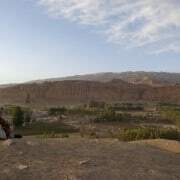 It is an area that allows us to experience what life is like in rural Afghanistan in safety. Finally we cross the spine of the Hindu Kush through to Mazar e Sharif to see the blue tiled shrine of Hazrat Ali and the remains of the once great Silk Road city of Balkh. 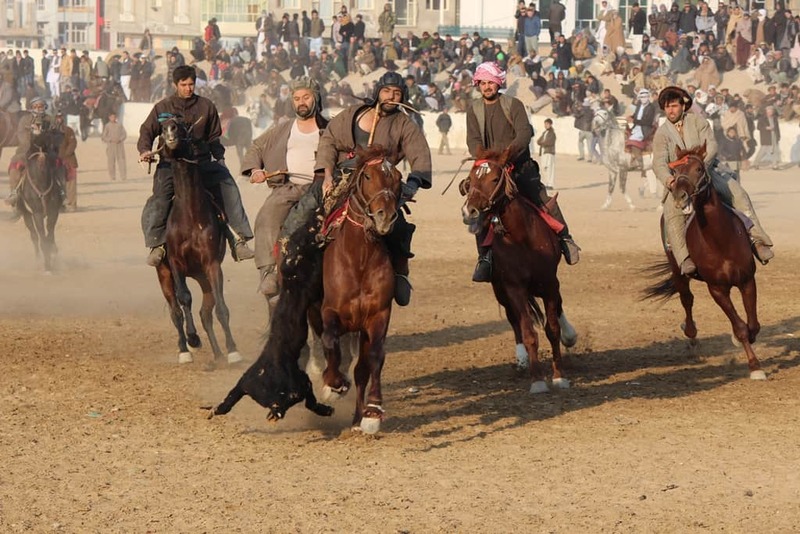 Hopefully taking in a game of Afghanistan’s national winter sport – Buzkashi. Arrival and briefing. For those who arrive early we will have time to take an afternoon tour of the city. This will include a visit to the British Cemetery, the hills of Bibi Mahru and Sakhi shrine. Fly from Kabul to Herat. The flight is early in the morning leaving us the afternoon to enjoy Herat. Herat has the largest collection of ancient buildings in Afghanistan and we will take a full day to explore the city and its surroundings including the Friday Mosque, the Tomb of Gowar Shad, the Masullah Complex and the atmospheric shrine of Khoja Ansari at Gazar Gah. A morning in Herat to visit any sights we may have missed on day 3. Fly to Kabul in the evening. Day in Kabul to visit Kabul Museum, Shah-e Doh Shamshira mosque and Babur’s gardens – the final resting palce of the first Mughal emperor. We will fly between Kabul and Bamian, the capital of the Hazarajat – home of the Hazaras and one of the most peaceful places in Afghanistan. When we arrive in Bamian we will have time to look at the hillsides containing many caves in which monasteries and Buddhist carvings were once situated. 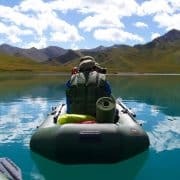 We will spend 3 days in and around Bamian, an area of striking natural beauty. The mountains and valleys are dotted with ruins from Afghanistan’s past as well as friendly Hazara villages. It is one of the few places in Afghanistan where we can walk freely and safely in a rural environment. The lapis lazuli blue waters of Band-e-Amir are often the highlight of any trip to Afghanistan. Legend has it that the dams that separate the 5 lakes were made by Ali, the prophet Mohamed’s cousin and son in law. However geologists insist they are natural dams made from mineral deposits. The lakes contrast to the stark landscape surrounding them only adds to the beauty of this area. We will also visit the natural landscape of Dragon Valley, see the ruins of Shah e Zohak (Red Fort) and the remains of Shah e Golghola (The City of Screams). Early morning flight from Bamian to Kabul. Lunch in Kabul then afternoon flight to Mazar e Sharif. Full day in Mazar & Balkh. The aim of the day is to watch a game of Buzkashi. Afghanistan’s national sport, played on horse back with a dead goat in place of a ball. 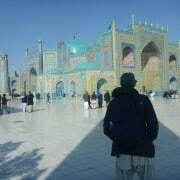 You will also have time to visit the majestic blue tiled tomb of Hazrat Ali, Afghanistan’s most important religious site. You will spend part of the day visiting the ancient silk road city of Balkh, called Bactria to the Greeks. Bactria was the birthplace of Zoroaster, the founder of Zoroastrianism as well as Rumi the legendary Persian poet. Legacy of its Islamic and Buddhist past can be found in the stupas at the entrance to the town, at the blue tiled shrine of Khoja Parsa and at the oldest mosque in Afghanistan, the 9th century No Gombad mosque. Overnight in Mazar e Sharif. A day trip to the Buddhist monastery remains at Samangan, two hours drive south of Mazar e Sharif. The 1500 year old complex contains a huge stupa carved out of the bedrock as well as a number of caves used as places of worship. En route you will also be able to visit Tashkurgan and the old king’s hunting lodge. We will fly back to Kabul, taking the opportunity to visit Chicken Street for any last minute souvenir shopping. We will visit the Panjshir Valley, described as the most beautiful place in Afghanistan by locals. We will stop to view the tomb of Ahmed Shah Massoud, the Lion of the Panjshir and Afghanistan’s most universally revered Mujahedin commander, as well as stopping off at a local fish restaurant on the banks of the Panjshir River. We will ensure that you are taken to the airport to catch your flight. 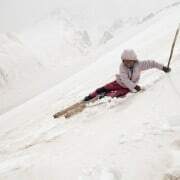 You will be accompanied by 2 team leaders from Untamed Borders for the entire length of this trip. Any additional flights needed in Afghanistan that may be necessary due to security concerns. A deposit of US$400 is required to reserve your place on this trip. We do not arrange Afghanistan visas directly. We will provide visa support in the form of letters of invitation to assist in your Afghanistan visa application. With the exception of breakfast, meals are not included as part of the trip. In our experience people sometimes want to eat different things in different places at different times. We know some great places and will also happily show you some of our favourite restaurants and tea houses. Some are luxurious, some are earthier, but all have character. However, we do not pretend to be the arbiters of good taste and are equally happy for you to go off and find your own favourites. We do not and cannot offer a uniform accommodation standard on our itineraries. 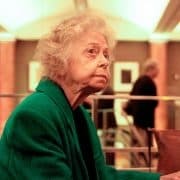 We consider comfort, location, design, character, historical interest and whether the money we spend will go into the pockets of the local community when we make our choices of where to stay. The accommodation will be based on 2 people sharing. In Afghanistan, we take at least 2 vehicles when driving between towns if there is a big group, for safety reasons. If there is a breakdown we will not be left stranded. When we choose our vehicles and drivers we take into consideration the road conditions, the length of journey and the competence of the man behind the wheel (not a laughing matter in a country that should be the setting for a live-action version of the Wacky Races). Your comfort and enjoyment of the journey is the first priority. On this trip, you will be accompanied by 2 team leaders from Untamed Borders. This allows for greater security and means that there will always be someone on hand to help or assist you even if the other team leader is busy arranging something. Sometimes we also hire local guides. If we are a large group, we may wish to split into smaller groups for city tours to allow greater flexibility and keep a lower profile. An extra local guide allows us to do that. Trips to Afghanistan do create dangers all of their own and whilst we want you to have as much freedom as possible we must state that the tour leader has the final word with regards to changes in the itinerary for safety reasons. Whilst the route we have chosen passes through areas that we consider to be stable things can change and we may have to alter the route or cancel sections of the trip at short notice. If there is an extra expense incurred due to the change of itinerary then you may be asked to bear part of that cost. For example, if we have to fly between cities rather than drive.